Président Pop-up. For lunch you’ll be spoilt for choice in the Gourmet Lane. In the Tasting Room, you can discover pairing secrets by well-known foodies such as The Food Alchemist Pete Goffe-Wood, The Kate Tin Katelyn Allegra, The Food Fox Ilse van der Merwe and the Italian La Terra dei Cuochi winner Lapo Magni. In the Cape Made Kitchen, chefs of the Private Hotel School will demonstrate specially developed recipes pairing cheese with bread and alternative products. Visitors will receive an exclusive recipe book as gift. Enjoy live music at the Music Gazebo with a lineup of popular artists. Safe fun awaits the little ones in the Kiddies Corner and they can meet the dairy animals in the Milk Factory. Make sure to enter the Ladismith Cheese Carving Competitions at Blossom’s Gazebo where great prizes can be won with your cheese masterpieces! The SA Cheese Festival is proudly water wise and invites you to help minimise the festival’s impact on water resources. 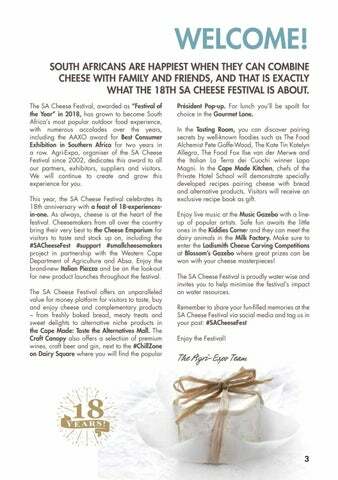 Remember to share your fun-filled memories at the SA Cheese Festival via social media and tag us in your post: #SACheeseFest Enjoy the Festival! Is jy ‘n BOK vir Kaas en gin? 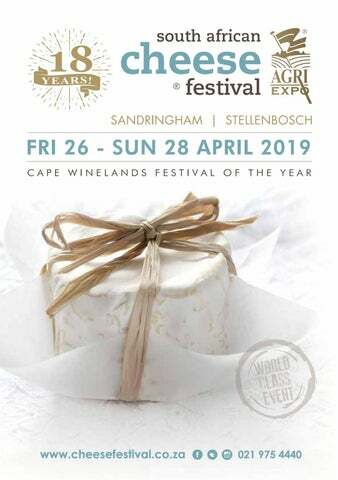 #support #smallcheesemakers Every year the SA Cheese Festival affords a number of small cheese makers the opportunity to introduce their cheeses to more than 30 000 visitors, thanks to the KLEIN KAASMAKERS support of our partners the Western Cape Department of Agriculture and Absa. Enter daily before 13:00. Limited entries. Prizes to be won. CHAMPIONSHIPS The annual SA Dairy Championships acknowledges quality dairy products and contributes to promoting excellence in the industry. Class winners are known as SA Champions, whilst the Qualité mark of excellence is only awarded to products of exceptional quality. Look out for these marks on retail shelves! Original Turkish Delight & Turkish Coffee. Vegan & Halaal Products. Middle Eastern Street Food Cuisine. Shawarma and Falafel. SUPPORTING AGRICULTURE TO GROW THE ECONOMY MAKES SENSE. NATURALLY. Farmers produce more than just food. They create jobs and grow the economy. This is why we support farmers and create an enabling environment. 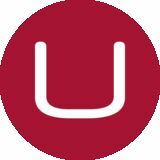 Visit www.elsenburg.com to see how we can support you. Supporting farmers for a better future BETTER TOGETHER.